Remember those days of yore, when John McCain was a man who put principle over partisan politics, somebody who could be counted upon to speak the truth? All of these are cuts in the obligations that we have assumed and are the rightful benefits that people have earned... I will eagerly look forward to hearing from teh authors of this legislation as to how they can possibly achieve half a trillion dollars in cuts without impacting existing Medicare programs negatively and eventually lead to rationing of health care in this country. 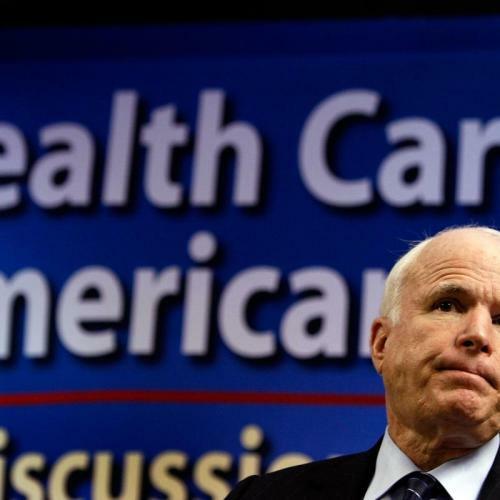 In October 2008, the McCain campaign announced that the Senator would pay for his health plan “with major reductions to Medicare and Medicaid…in a move that independent analysts estimate could result in cuts of $1.3 trillion over 10 years to the government programs.” Those cuts would have reduced Medicare and Medicaid spending by as much as 20% over 10 years and cut into benefits. McCain has plenty of company in his hypocrisy. As Volsky goes on to note, many of the Republicans likely to vote in favor of McCain's amendment voted for the Balanced Budget Act of 1997, whichalso called for substantial Medicare cuts. Sam Brownback, Charles Grassley, Jon Kyl... the list goes on. Of course, there were some critical differences between the Medicare reductions Republicans backed during the 1990s and the ones Democrats propose today. But those differences don't exactly put the Republican attacks in a more favorable light. During the 1990s, Republicans eyed Medicare savings as a way to free up money for tax cuts, the majority of which would benefit the wealthy. Today, Democrats want to use Medicare savings as a way to finance health care reform, which will--on balance--do a lot more to help the poor and middle-class. You can argue whether such a shift is fair--more on that later--but it's hard to argue that such a shift is less fair than what the Republicans had in mind. In the '90s, the Republicans weren't overly specific about the kinds of cuts they had in mind. They simply wanted to slash Medicare's funding, in many cases because they supported Newt Gingrich's crusade to let Medicare "wither on the vine." 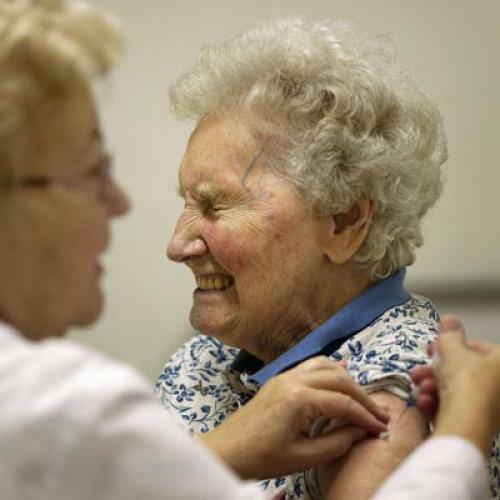 The Democratic approach is to find savings that target the program's inefficiencies, whether it's unjustified subsidies to private insurance companies or payments to hospitals that have chronically high rates of inpatient infections. If those reductions work as planned--and I think there's good reason to think they will, although I concede that's a fair debate--one result will be better care for seniors. Most important of all, though, may be the sheer magnitude of the cuts on the table. In October, the Kaiser Family Foundation compared the proposed reductions in the House and Senate health reform bills to the ones that passed into law as part of the 1997 Balanced Budget Act. The Foundation's staff concluded that the Senate bill would reduce Medicare spending by 5 percent over ten years, while the Balanced Budget Act reduced spending by 12 percent (which, by the way, was a lesser reduction than the Republicans originally proposed). Kaiser based its comparison on the bill that the Senate Finance Committee passed. 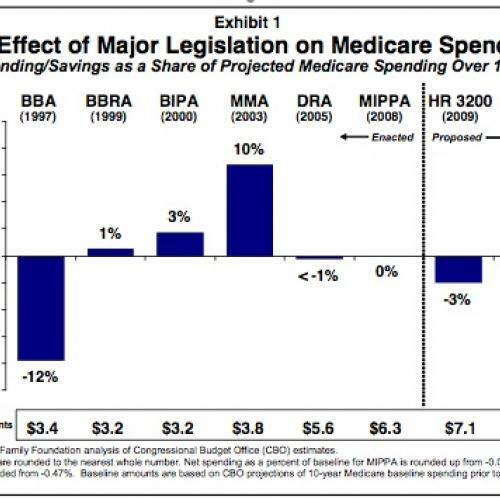 I'm pretty sure the final Senate bill has slightly larger Medicare reductions. (I'm still checking on that.) But the bottom line would be the same: The reductions in Medicare Republicans are now decrying are more equitable, better targeted, and not even half as large as the ones many of those same Republicans endorsed in the '90s. Of course, seniors on Medicare don't really care about who's being intellectually consistent and who's being hypocritical. They want to know what's going to happen to their Medicare, period. It's a reasonable question--one I'll address shortly, in a separate post. Update: Media Matters discovers even more GOP hypocrisy on Medicare.